I kept hearing about La Rosa’s. Not from just anyone but from people who knewwhattheyweretalkingabout. You know, Dennis from the Saturday morning Reading Terminal coffee crew or Philly Phoodie. What intrigued me was not their supposed simplicity, square pies or local charm. Instead, I was drawn towards their potato pie. Potato pie?! 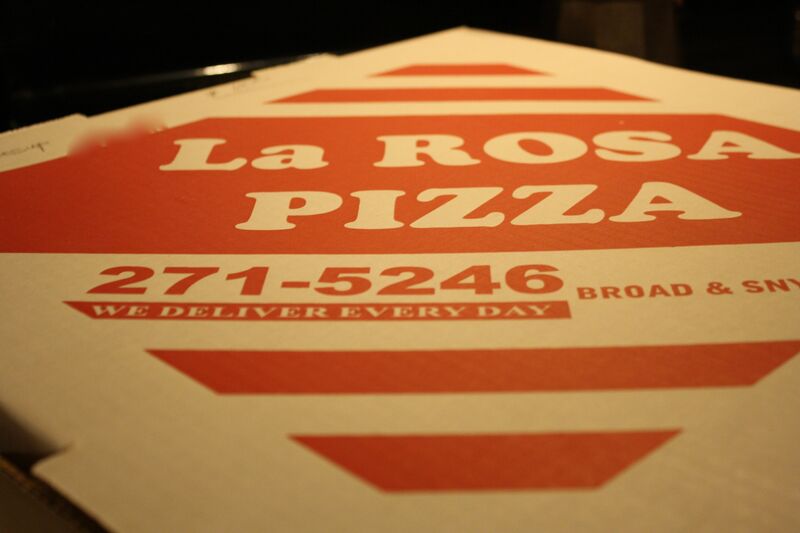 I live steps from La Rosa and folks were SHOCKED upon hearing that I had never tried their pizza–in particular the potato pie. POTATO? On a PIZZA? I had to check this out. My husband, on the other hand, was a bit skeptical. He’s never been a carb fanatic and the concept of potato on dough had him leery. I waited patiently until he left for a weekend visit to his grandparents’ place in South Carolina. Three nights of eating for one. I obviously had to plot accordingly. On the second night, I decided that I would finally go in for the kill. I googled “La Rosa menu” to no avail and wondered how I would decide what to order. I saw somewhere that they would do halves and the question arose–what do get on the second half? I ended up asking the friendly man who took my order for a half potato (duh) and half sausage pie. One size. After a brief wait, my pie appeared. The simplicity of the place is evident in my order and contact info scratched quickly onto the bare box before it is filled with my cheesy, doughy bounty. The weird photoshop smudge on the upper left is my erasure of my phone number lest I get overwhelmed by my myriad fans. I opened the box to a thing of beauty. Wait, hold on. Let’s get a little closer here. Look at that rosemary, eeeeh!!! I started with a piece of each (actually, I finished with a piece of each too. Two pieces was more than enough for me.) The pizza, despite the speedy delivery, was a little cooler than I’m accustomed to. Regardless, the sausage was phenomenal. 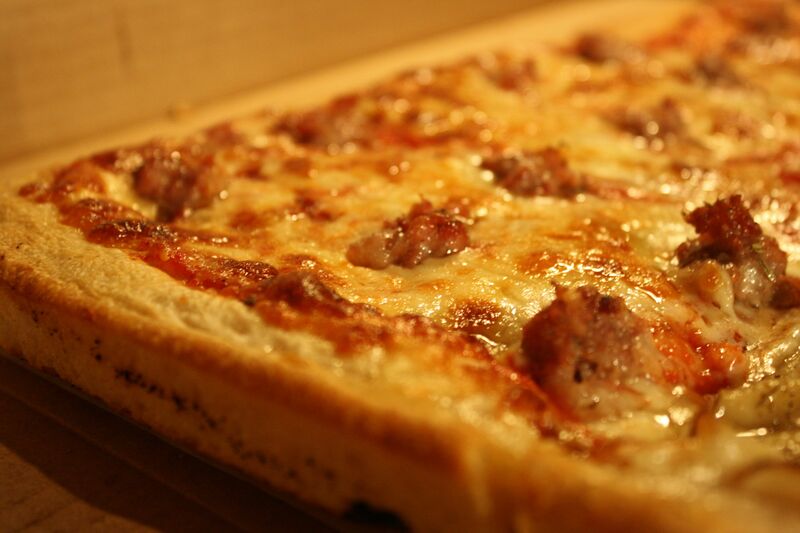 It had an excellent ratio of dough: cheese: topping and the crumbled sausage was just. so. flavorful. The slight fennel flavor subtly imposed on each bite. The potato on the other hand was, well, different. The flavor was absolutely spot on–the traditional marriage of rosemary and salty potatoes was managed perfectly. The pizza suffered from the temperature, however. I did not realize until the next day (when I had a slice reheated in the oven) that the best way to enjoy the potato half of this pie is hot and crispy, right from the oven. So, if your order takes a little longer or (ahem) someone insists on having a photo shoot before eating, stick it in the over for a few minutes. You’ll thank me. 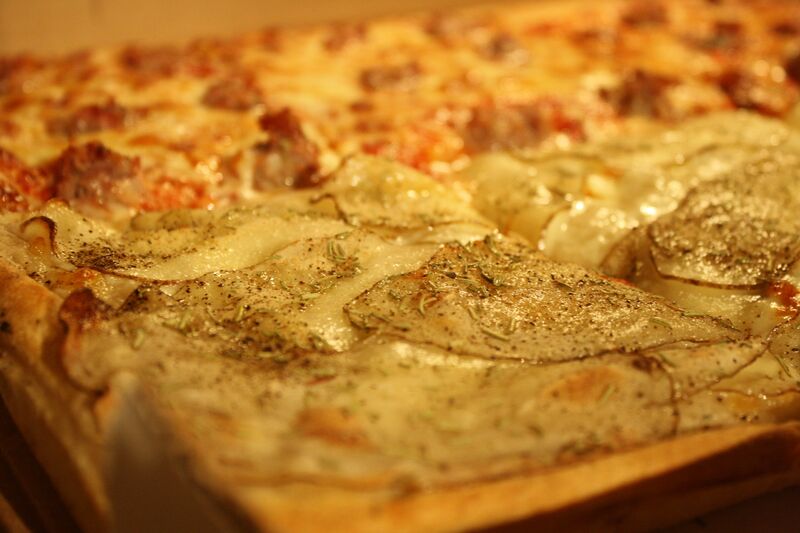 Despite the minor temperature woes, I dare you to try the potato pie. I know you’ll like it. I have never heard of this place – I really want to check it out now! Looks delicious – and good pics! I can imagine that the potato pizza really does need to be right out of the oven. 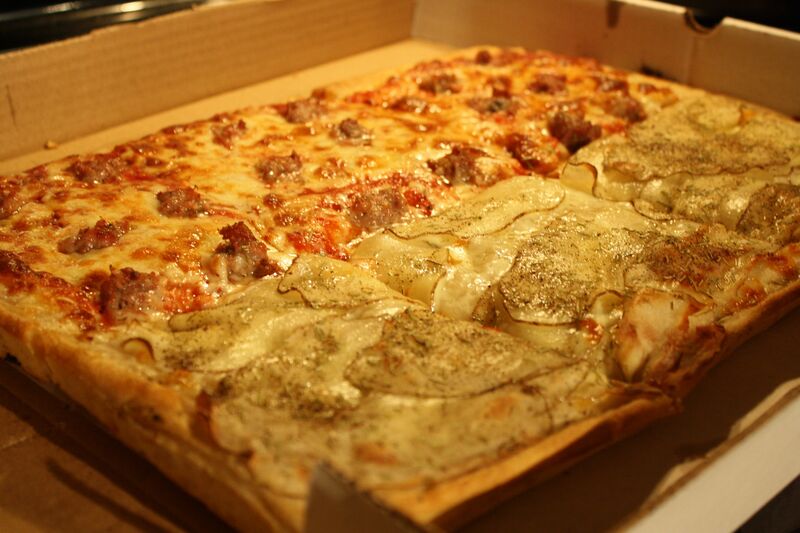 Same with baked ziti pizza. Otherwise its all rubbery and gross! I love LaRosa pizza. My favorites are broccoli-red or the sliced tomato. I love the plain too. We live in Arizona now and will have our friends overnight it to us when we get the craving. Wow, overnighting pizza. I’ve never heard of that. You guys are committed! The broccoli red sounds tasty. Will have to check it out in the future. Mmmmmm… This looks amazing. One of my friend’s dad owns a pizza shop in CT, and they have Red Potato Pizza. Which according to google is: A plain crust with sour cream, sliced red potatoes, sharp cheddar cheese, chives and your choice of bacon, broccoli or both. She used to bring them back to Philly frozen. It’s really, REALLY incredible.